British sports car maker McLaren takes another step in the Track25 plan and launches a fifth long-tail model. It’s the McLaren 600LT Spider. Longtail models have a long tradition at McLaren . The longtail story began in 1997 with the McLaren F1 GTR Longtail. In 2015, the McLaren 675LT Coupé was followed by the first long-tail model of the modern era, followed by a corresponding Spider. Both models were limited to 500 units and immediately sold out. The fourth model to be nicknamed Longtail is the McLaren 600LT Coupé , which was presented in July 2018 at the Festival of Speed ​​at Goodwood . Now the fifth model of the Longtail family has been unveiled. The McLaren 600LT takes over the complete technology and equipment of the corresponding coupe . With its three-part retractable hardtop, the open two-seater is about 50 kilograms larger than the closed brother, yet a curb weight of 1,297 kilograms is an announcement in this class. The extra weight comes exclusively from the hood, the carbon chassis had no additional stiffeners necessary. The open two-seater is fired by the well-known 3.8-liter twin-turbo V8, which brings it here to 600 hp and 620 Nm of torque and hangs on a seven-speed dual-clutch transmission. It goes from zero to 100 km / h in 2.9 seconds – tie with the coupe . Up to 200 km / h, the Spider takes 8.4 seconds 0.2 seconds longer. The maximum speed for the McLaren 600LT Spider is 324 km / h. With the top down, it should still be 315 km / h in it. A convertible top allows McLarenbut only up to 40 km / h. When the roof is open, an electrically retractable rear window between the seats to mitigate the storm in the cockpit. On the other hand, you can also regulate the sound that penetrates into the cockpit, from the upwardly opening exhaust system. When the roof is closed, the then empty convertible top compartment behind the seats offers additional storage space of 52 liters. 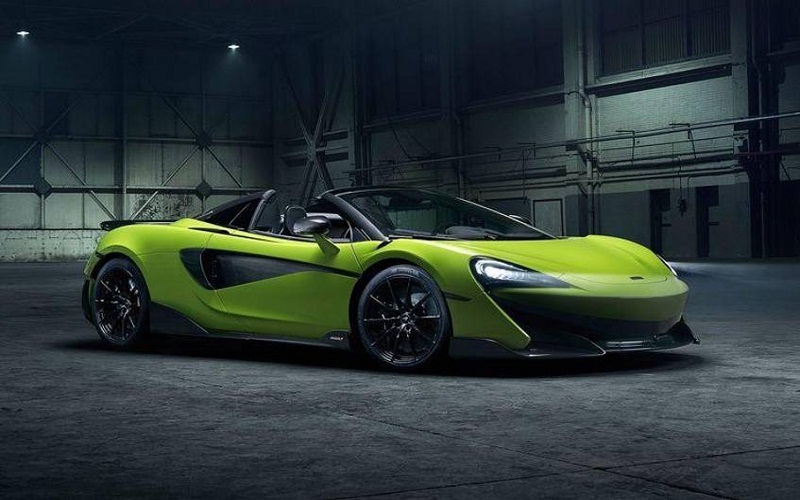 The McLaren 600LT Spider is limited as its coupe brother in the edition – he should remain only twelve months in production. The basic price is 201,500 pounds plus taxes (equivalent to 226,000 euros plus taxes). PREVIOUS POST Previous post: Mick Schumacher in the Ferrari squad?